Tar and chip is a unique and durable paving option. It is much like traditional asphalt, but with one key difference: the contents are mixed on site, as opposed to the routine asphalt process of being premixed and delivered to the project site from an asphalt plant. With the Tar and Chip method, a hot liquid adhesive is applied to the surface, chips of stone are laid on top, and a roller is used to press the stones into the tar and smooth the surface. This often overlooked technique is cost effective and allows for advanced customization for your project. 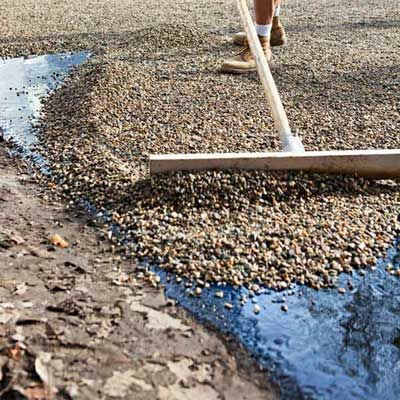 Tar and chip, commonly referred to as Chip Sealing, provides the option to choose the color of your driveway through the selection of the color and type of stone used in the mixture. This process can also be cheaper and require less maintenance than a comparable asphalt installation. RVA Paving will help you determine what approach is best for your project!